When you’re in the fight game, being able to explode and generate power can be the difference between a raised hand and the lights fading to black for a few minutes. Fighters need to be able endure exhaustion and pain. They also need to be able to explode into a movement at the drop of a hat. To be able to do this it takes a certain level of strength. Explosive strength however is a bit different than simply being able to push or pull a lot of weight. 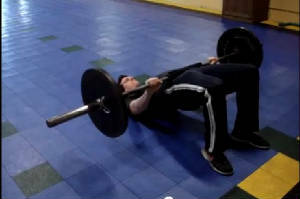 Explosive strength requires you be able to move a lot of weight or an object in an incredibly quick fashion. Today we are going to talk about explosive training exercises a person can incorporate into their MMA training. If you have ever taken a basic science class then you have heard of Sir Isaac Newton’s second theory of motion. His theory says Force equals mass times acceleration. Simply put the faster an object moves the more force it will deliver. To put this in fighting terms the faster and more powerfully a fighter delivers a blow, the more damage it does. If you take this theory and apply it to athletic or sport specific training it makes perfect sense. Since fighting requires movements like striking, hitting, and sudden changes of direction, training in an explosive manner would be the most directly related way of doing things. Anyone who knows me or has worked with me knows I am a big advocate of using weights in training. They also know however I am a bigger advocate of using what works the best over using any one type of training or equipment. The first thing to understand is explosive training is very different than weightlifting or training like a bodybuilder. Explosive training is more about movement training than overall muscle hypertrophy. Explosive training requires the entire body to move quickly at once. Moves that isolate certain muscles or lifting at a slower pace tends to have less of a place in MMA training. When your training explosively, even though you may lift some weights or perform some weight lifting exercises, it is all about the manner that the exercises are performed in. One of the best ways to effectively use explosive training in MMA is to perform movements that naturally occur in the sport. Running, jumping, hitting, striking, pushing, pulling and lifting are all things that naturally occur in a fighter’s practices and fights. A fighter’s MMA explosive training should have training movements that most effectively can mimic or move in a similar fashion to those movements. MMA explosive training should also implement some sort of strength work. Not only does a fighter have to be explosive in the ring but having a measure of strength while doing it won’t hurt either. This is where adding explosive weighted movements can be a big help. Lifting barbells, dumbbells, or objects in an explosive manner not only builds explosiveness but also a degree of strength. 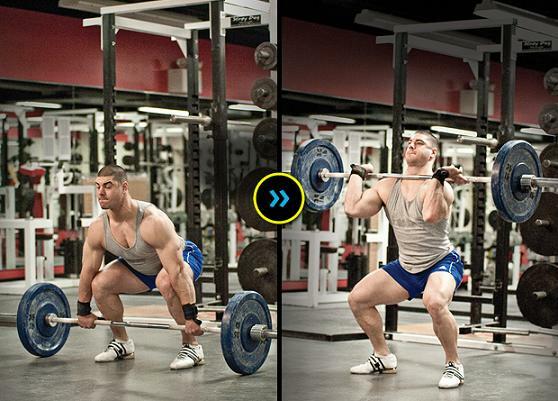 One of my all time favorite lifts to use is the combo lift of the Clean Squat and Press. Exercises like Power Cleans, Deadlifts, Dumbbell Snatches, and Kettlebell Swings are all great choices that could be used. So what should a fighter try incorporating into their workouts for exercises? Here are a few of what I think are good and effective choices. As far as explosive training goes Power Cleans give you a lot of bang for your buck. Power Cleans do a great job at building overall strength and explosiveness rather quickly. What makes the Power Clean so good is you have to pull explosively, jump, and lift explosively all in one movement. Power Cleans being a full body movement, you are using a lot of muscles at once. The Power Clean teaches the whole body to move quickly and all at once. Want to be explosive? Run fast and run often. While the distance run is great for endurance, sprinting is the way to go for explosiveness. Sprinting is not for just the legs but sprinting works the whole body. If moving the body quickly all at once is the goal add sprinting into your training. Sprinting is also great for overall conditioning. Sprint interval training is one of the fastest (no pun intended) ways to burn up excess body fat. Think about someone you know who is really fast. I guarantee they are probably not sporting a spare tire around their midsection. In the words of the House of Pain song-Jump Around!!!! I mean jump over stuff. Jump on stuff. Jump with stuff in your hands. Just plain jump! Why am I so gung ho about jumping? Well for one jumping is one of the most explosive moves you can do. Secondly jumping is all about the hips and hip flexors. In MMA hip flexor and hip mobility is ultra important. The hip flexors also have a direct relation to a person’s speed, so the better a person becomes at jumping, the more overall speed they also will develop. 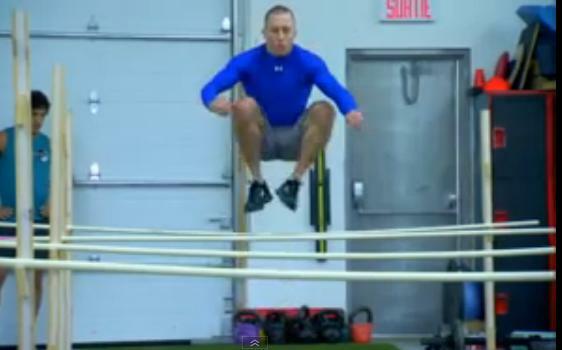 Use a variety of different jumps in your training alternating jumping styles and types every few workouts. I’m sure everyone at one time or another has seen some type of landmine exercise, weather they realize it or not. What a landmine exercise is when you place one end of a barbell in a corner and place some sort of weight on the opposite end. From there you sort of have a giant lever that can be used for pulling, pushing, twisting, squatting, and many movements. With this giant lever any variation you do can become an explosive full body exercise. One of my favorites to use with MMA athletes is a one arm squat and speed arm thrust. 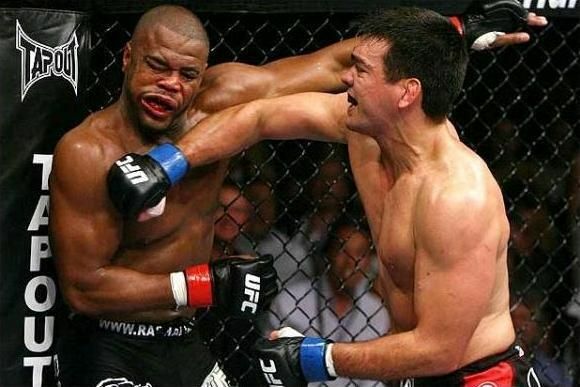 This movement helps athletes with changing levels and jabbing or pushing opponents off. No matter what your fitness goals are, Barbell glute bridging is a fantastic exercise to regularly have in a routine. Hands down no other exercise does a better job at strengthening the glutes and hips. Bigger stronger glutes means stronger hips, hamstrings and back to boot. Now while a MMA fighter may not be worried about stronger firmer glutes, they will be worried about stronger more explosive hips for punching, kicking and fighting for position. To truly be beneficial to an MMA fighter’s training they should do glute bridging in a fast explosive manner. If you’re a fighter, developing your explosiveness could be a very overlooked part of your game. Developing explosiveness will not only improve your strength and speed, but also your agility and overall athleticism. By incorporating some explosive moves and exercises in your training program you’ll be more of a force, come fight time. Click here to check out more training articles in the Past Articles Section.